From The Bad Seed and The Good Egg creators, Jory John and Pete Oswald, comes a story about a dinosaur who loves to ROAR. William the dinosaur likes to roar. At the farm? You bet. ROARRR! William never lets the chance to roar pass him by, even if others find it rather bothersome. That's until William gets a sore throat and the doctor warns him not to roar for a WHOLE week. But can this overexcited, boisterous, giant lizard not do what dinosaurs are meant to do?! In his humorous and insightful style, Jory John creates an epic story about unapologetically and happily being yourself, no matter the cost. 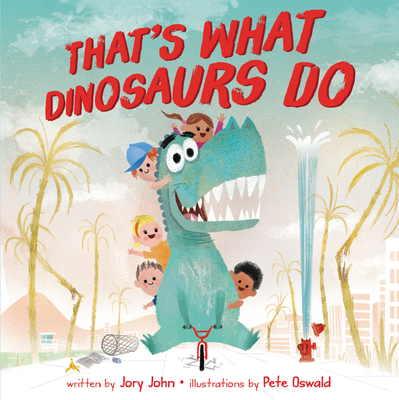 Another side-splitting combination of John’s brilliant text and Pete Oswald’s expressive and lively illustrations, That’s What Dinosaurs Do is a read-aloud that young readers will roar for again and again.